When Lance Cranick burned trash in a barrel behind his grandparents' house, he probably didn't expect to ignite a national debate on the services municipalities need to provide for their citizens. Yet that's exactly what happened on September 29, when the sixteen-year-old resident of Obion county, Tennessee left the fire unattended while he took a shower. When he returned, a nearby shed was aflame. Despite his efforts to stop the fire with a garden hose, it soon spread to his grandparents' home. Lance's grandfather, Gene Cranick, called the nearby South Fulton fire department to request assistance. But, despite his increasingly frenzied calls and his offer to pay for help, the fire department refused to send trucks to the scene: apparently, Cranick hadn't paid his yearly fire subscription, a $75 fee that some rural residents in Obion have to pay in order to get fire department service. As a result, firefighters left his house to burn. Eventually, the fire department responded to the calls for distress -- when the fire spread to a neighbor's property. 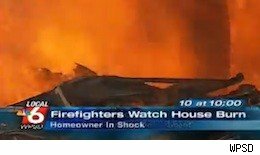 Unlike Cranick, the neighbor had paid his fee, so the firemen sprayed down his lawn. Afterward, they watched as Cranick's house was destroyed. In addition to burning all the family's possessions, the fire also claimed the lives of the Cranick's three dogs and one cat. For commentators on both the left and right, the Cranick conflagration was a sterling example of the effects of a pay-as-you-go model of government services. Radio and television commentator Glenn Beck was quick to jump into the fray, siding with the fire department: "Those who are just on raw feeling are not going to understand...If you don't pay the $75, then that hurts the fire department. They can't use those resources and you would be sponging off of your neighbor's $75...This is important for America to have this kind of debate, because, A, this is the kind of stuff that is going to happen. We are going to start to have to have these kinds of things." Meanwhile, in The National Review, conservative commentators battled over whether or not the fire department responded correctly. While traditional conservative Daniel Foster argued that the fire department should have taken up Cranick's offer to pay them whatever it cost to put up the fire, the more libertarian Kevin Williamson replied that "The world is full of jerks, freeloaders, and ingrates -- and the problems they create for themselves are their own. These free-riders have no more right to South Fulton's firefighting services than people in Muleshoe, Texas, have to those of NYPD detectives." Commentator Jonah Goldberg took the argument a step further, noting that the Cranick's fire will offer a major incentive to other homeowners: "Letting the house burn will...save more houses over the long haul. I know that if I opted out of the program before, I would be more likely to opt-in now. No solace to the homeowner, but an important lesson for compassionate conservatives." From an absolutist, legalistic perspective, Beck, Williamson and Goldberg have a point: Cranick failed to pay his fee, and thus was not entitled to fire services. He, apparently, was under the mistaken impression that local governments are obligated to provide firefighting services. After the fire, he told reporters that "I thought [the fire department] would come out and put it out, even if you hadn't paid your $75, but I was wrong." Cranick's misunderstanding isn't surprising: three years earlier, he had called the fire department to help with a chimney fire. Although his account was in arrears at the time, the fire department responded, letting him pay the $75 after they extinguished the fire. In an interview with Daily Finance, Obion County mayor Benny McGuire cleared up the question of responsibility for public services, noting that "We provide law enforcement, schools, and some health care services, but fire protection is one thing we don't have to provide." Moreover, given the price of fire coverage -- a 2008 study estimated that it would cost at least $554,000 per year to protect the entire county -- it is a service that Obion cannot currently afford. Obion County has eight municipal fire departments, all of which are supported by town taxes. Traditionally, these departments have provided coverage to the county. However, faced with the high cost of fire equipment, three of the towns -- South Fulton, Kenton, and Union City -- decided to adopt a subscription model, under which they offer coverage to rural homeowners located within five miles of the town, but charge $50-$75 per year for the service. Local departments also tried a "pay-as-you-go" system, under which they charged $500 to put out a fire, but were able to collect less than 50% of these fees. Faced with a funding crisis, Obion identified three options: to pay for fire services, it could raise county income taxes, charge subscriptions to every rural homeowner in the county, or increase property taxes by $0.13 per $100 of property value. The property tax plan tanked, as farmers in the area didn't like the idea of paying taxes on farmland to provide services to homeowners. Regarding an income tax increase, the county faced political pressure to keep taxes low: as McGuire put it, "County commissioners will not raise taxes to provide fire service." The only remaining option is a county-wide subscription service, on the South Fulton model. On October 18th, the county commission will vote on that proposal. Nobody seems terrifically pleased with the current situation. In an interview, Howard Schaitberger of the International Association of Firefighters described the South Fulton fire department's behavior as "incredibly irresponsible." Meanwhile, Union City Fire Chief Kelly Emison told reporters that he prefers the property tax plan, noting that the proposal would make his job easier: "It eliminates this having 911 or whatever check to say, 'Are they covered or not covered?'" For that matter, Paulette Cranick has stated that she does not blame the firefighters, although Timothy A. Cranick, Gene's son, was arrested after he assaulted South Fulton's fire chief. Commentators from Keith Olbermann to Janine R. Wedel have noted that the Tennessee farm fire illuminates a larger conflict between conservative and liberal notions of government. As conservative politicians push for tax cuts and libertarians push for privatization of government services, it is worthwhile to ask exactly which services a responsible society should be expected to provide -- and what responsibility taxpayers have to foot the bill. With municipal expenditures for schooling, postal services, law enforcement, and fire departments on the table, Glenn Beck's analysis was absolutely right on at least one level: it is absolutely important for America to have this debate, because the Cranick's fire is exactly "the kind of stuff that is going to happen."